Christmas is coming!! Christmas is coming!! In 5 months. I’m celebrating Christmas in July with this adorable “I Love You With My Whole Heart” Bisque Porcelain Figurine that perfectly represents our little family! 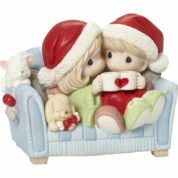 This is just one of many super cute Precious Moments figurines and ornaments that will make your home extra cozy whether you’re celebrating Christmas on July 25th or December 25th! 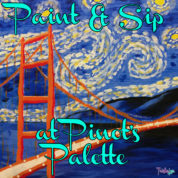 Happy Anniversary to Pinot’s Palette in my hometown, Alameda! This location recently celebrated their 1 year anniversary of bringing paint & sip experiences to the East Bay. I was their guest at their anniversary class last month and it was a blast! Recently, the awesome folks at Hanes Brands sent me a pair of Just My Size Cotton Jersey Women’s Shorts in Black. As a plus size woman, I’m always looking for active wear for the gym or lounge wear for hanging around the house that’s comfortable but doesn’t look like I’ve completely given up on finding clothes that fit me, either. I was happy to give Just My Size a shot. Luckily, while some brands sizes run small, Just My Size makes their sizing chart very easy to decipher. I picked out the size that matched my measurements and decided on Ebony (black). While these cotton jersey women’s shorts come in lots of colors (Emerald, Blue, Ebony, Cabaret [hot pink], Bright Violet, Light Steel, Blue Blaze, and Pink Cactus), I tend to err on the side of black when it comes to shorts… I definitely don’t need anything drawing more attention to the size of my derriere, thank you! I started by wearing this out just around the house. Since I work from home, there’s no dress code, and the weather has been getting increasingly warmer as summer approached, so shorts are my go-to. The cotton was nice and soft for sitting in my office chair or lounging on the couch, but not too thick or hot like sweat material can be. They are long enough to not feel like they’re constantly riding up, but not so long that I feel like I might as well be wearing capri pants (let’s put aside that, because of my short stature, I’ve literally tried on capri pants that were perfectly pant/ankle length on me). Usually, if I’m going to leave the house, I’ll change into jeans, jean shorts, or a couple of pairs of cotton twill shorts I have in a pinch. I’d usually never wear cotton shorts like these out of the house and in public unless at the gym (at which time I’m lucky I’ve even been motivated enough to go, so I don’t care what I really look like so long as I’m clothed). However, one day when I was wearing these Just My Size Cotton Jersey Women’s Shorts, my brother (who lives with us) came home from work and wanted to go grocery shopping. Since his car is busted right now, I rushed to finish up what I was working on and we went to the grocery store. It wasn’t until I got to the store that I realized I hadn’t changed my shorts, as I’d intended to. Pockets! I can’t stress enough how nice it is to have cotton shorts with pockets. The last two cons really just mean that I won’t be able to throw them in with the majority of my clothes. I have a some clothes that get washed separately since they go into the dryer at a lower setting or get hung to dry anyway, so I just need to remember to throw these into that basket! That’s okay, because I definitely don’t want my new comfy shorts to shrink before I do! One of the best features of these shorts is the price – right now they’re only $7.79! It’s an incredible deal and really, if you wanted to buy a few pairs, this price is very easy on the pocket book. In general I appreciate that Just My Size clothes are plus size clothes that aren’t plus size prices. I’ve never bought any Just My Size brand clothing that were uncomfortable or overly expensive. It’s a great brand for those of us who are plus size and don’t want to feel like sausage stuffed in a casing all of the time! Seriously, they’re not even $8. When was the last time you got any piece of clothing that was under $8 brand new? Heck the last t-shirt I bought was $15! That’s two pairs of shorts! Stock up on several colors to get you through the summer. I’ll be picking up another pair myself. You won’t regret this purchase. Disclosure: I was provided a pair of Just My Size Cotton Jersey Women’s Shorts complimentary for review. This opinion is 100% my own. This is a sponsored guest post written by Samuel Seymour on behalf of CompeteSEO, LLC.. Post powered by Sponzai. Stop wasting time submitting your website, articles and blog posts to social bookmarking websites! Get thousands of backlinks with a few clicks and let our team work submitting your URL to popular social sites, article sites, and even link directories. Want backlinks at a slower pace? We can submit your URL to social bookmark site within a couple days or a couple months with our slower link building packages designed for newer sites. Full link reports are available for each link building campaign listing every backlink we obtain for you. Our highly active social profiles allow your links to be indexed within the search engines quickly allowing you to rank higher in the search engines faster. Want your own accounts? Let us create unique accounts on 2,000 social networks that allow social bookmark link submissions. We’ll go ahead and submit your first link then supply you with each username and password for you to manage your links and new accounts in-house. Focus more of your time and efforts on bigger and better things when you leverage CompeteSEO’s social bookmarking and link building services. Save even more with this special coupon code good for 30% OFF your first order no matter how many packages you get.